Bet up to 3 hands at a time, and split them up to 3 times. This game has NO SILLY GIMMICKS, and is a true to life BlackJack simulator. The game engine behind this game has been used in live internet casinos and has been verified by the government it ran in. This is why many have called this game not just another BlackJack game but a BlackJack Simulator. With an interactive learning mode, built-in bet cards, and many card counting systems you will learn to play BlackJack so you can win big when you visit a real casino. * A career mode with a bank borrowing system to track your true net winnings. * Lots of stats including a full game log that you can E-Mail yourself to analyze how you can improve your game. * Customizable rules so you can tweak the game your local casino and play styles. * A world-wide online leader board so you can see how you compare to other BlackJack players. * A Cheat/Practice mode which allows you to try new game styles by peeking at the dealer’s hole card as well as the shoe, and not effecting your career mode data. * Continuous Shuffle Machine (CSM) option, to simulate today’s modern casinos. 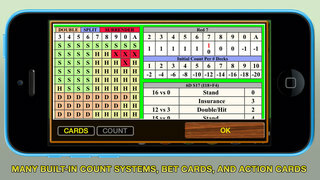 * Over 10 Side-Bets such as Perfect Pairs, Match The Dealer, and more. * 40+ achievements to unlock ranging from simple to diabolical, you won’t want to stop playing until you reach them all. * Many card counting systems (including Red-7) to help you learn to count utilizing the True Count as well as a Count Action Card. * Fluid animation, lots of sound effects including an interactive dealer, and finger gestures mimicking real life casino hand motions. * Optional CPU players to play alongside you. * Alternative sound and art packs. If you are experiencing problems please use the Support forum on our website (www.pepperdogsoft.com) as we can better help you there. Also try our other casino game «Sic Bo / Hi Lo», which is a ancient Chinese gambling game combining a bit of Craps and Roulette.